Synopsis: In order to participate in athletic programs many schools require that athletes obtain a physical each year. What do you do when the community you live in has very limited healthcare resources for you to get this physical? This is the barrier facing many high school student athletes in the Sacramento Delta region of Northern California. During their intern year, three Family Medicine residents decided to tackle this challenge (no pun intended!) 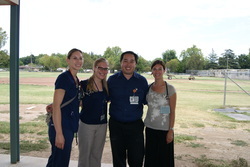 and brought sports physicals to the local high school in July. With a school physical program already well-established at a high school located near the UCD Medical Center in place these residents have a framework for establishing a school physicals program in the Delta region. By working with the community during the planning and implementation of this project, this group of FM residents is helping to ensure the sustainability of this project in the future.